South Louisiana, Where The Food Is Good And Life Is A Party! Mmmmm, Mmmm, Chere! 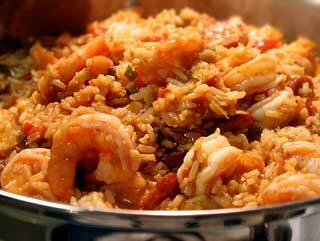 Talk about some good eating, Shrimp Jambalaya is one of my favorite dishes. Shrimp Jambalaya is a Creole or Red rice dish made with tomatoes as opposed to a meat based Cajun jambalaya that has no tomatoes and is darker from the browing of the meat. You can compare this recipe to my Jambalaya recipe that I posted last year. Shrimp Jambalaya is very popular throughout the year but particularly during Lent when us crazy South Louisiana Catholics observe the penance of not eating meat on Friday's to make up for all of our debauchery the rest of the year! This recipe is taken from the old New Orleans Ursuline Nun's cookbook entitled "Recipes and Reminiscences of New Orleans" published back in 1971. I don't know about the rest of the nation but Popeye's Fried Chicken restaurants in Louisiana serve Shrimp Jambalaya during Lent just for us! Ahhh, eeiiii! Peel the shrimp and set aside. In a large pot, saute onion, celery and bellpepper in oil until wilted and onions are clear. Add parsley, tomatoes, tomato sauce, garlic and seasonings, stir well. Cover and simmer about 5 minutes. Add rice and water, bring to a boil. Reduce heat to low (or warm if your stove runs hot) and stir in shrimp. Cover tightly. Allow to cook untouched for 25-30 minutes. Peek under the lid to see if rice is cooked. Stir to fluff the rice and serve with a nice salad. Be sure and use Gulf Shrimp and you will never use anything else. they have a rich beautiful flavor that makes all other shrimp taste like rubber. From South Louisiana, I am a southern belle and a crazy Cajun all rolled into one! I love to cook so I decided to share my favorite Southern, Cajun and Creole recipes along with some others that I have tried and enjoyed as well as some experiences, thoughts and every day living. I hope you enjoy this blog as much as I have enjoyed creating it! Laissez les bon temps roulez, darlin!